... and configuring the Router. This is the first step-by-step tutorial, on how to retrieve the password of your Arescom router for the sole purpose to configure the router conforming your wishes. As many other user, I received a Arescom NetDSL 1000 Router with mu Zonnet broadband subscription. And like others I was wondering how to get the password of this router so I could configure it properly. Zonnet wasn't giving it, and searching the Internet didn't help too much either. So this brought me to write this tutorial for the Arescom NetDSL 1000 Router. The technical background on this trick is similar to the trick used on the website of neworder.box.sk. As usual with hacks, please read the disclaimer before proceding! Inorder to retrieve the password, we use a so called 'sniffer'-application. Several applications are good for this purpose. I presonally recommend the application I found a http://www.ufasoft.com which is sufficient for our purposes. You can also download it right here at WeetHet. You will also need the management software which you can download at website of Telindus. 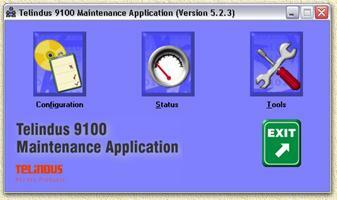 Local maintenance software for Telindus 11xx ADSL series rev. 5.2.3 [3245 KByte]. Normally this is included with the Arescom Router, only the images might be different. This application can also be downloaded from WeetHet (extract with WinRar). Install both applications and start the sniffer application. Select the protocol Ethernet, IP and UDP. Now start the Telindus management application. The application tries to find the router using a UDP broadcast over the network. Besides that a UDP unicast packet will be send as well, the router will answer and send both routername and password, so the software can get access. The sniffer software can be used to read the raw ASCII formatted (plain text) data. In this data we will find both routername and password (in the screenshot above, masked with XXXXXXX). The default routername is dsladmin. For security reasons we will now change the password of the router. Now the most important issues are settled, we can finally configure 'our' router the way WE want. Naturally, this trick is a serious "security issue" that's why we follow the suggestion of Neworder.box.sk. They utilize a telnet session to give this command: "add auto udp 9833 9833 9833 10.0.0.10" (without the quotes). This to prevent others for soing the same trick to our router as we did :-). COnfigurations of the router can be saved to a regular text file. This makes sense for backup purposes! Select "Save configuration File As" and save the configuration. We might need it later on. Zonnet by default delivers two possible configs, 1 with everything locked and 1 with everything wide open. Naturally we would like to bring a little fine tuning in between these two extreems. Naturally, it would be usefull to have both Zonnet configs availabel - if you are using Zonnet. Both are save in this zip file, 1 = the standard version, 2 = the wide open version. Note: use either WinRar or Winzip to unpack this file! Caution: these Zonnet configurations cannot be used without a slight modification!!! After these changes you can use "Load Configuration File" in "Configuration" of the Telindus applicatie to upload these files to the router. Click "Load configuration file..." and select the (modified!) file you want to upload. Click "Exit", the new configuration is now activated. A complete manual (pdf formatted) with a complete guide to the management application can be found at Arescom - additional software can be found here (thanks to Luc and Bas).